In the game 4 I played against the army that is going to be (or is already becoming) a very popular choice thanks to the new Mantic releases - the Night Stalkers. 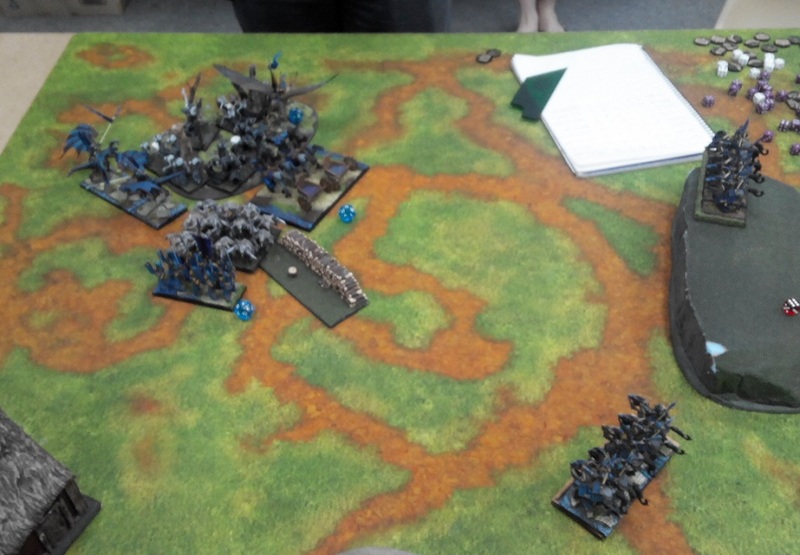 I played against Sean who is getting back to wargaming with this army. We played against each other long time ago so it is great to have him back. I am sure he has an eye on the new concept art and models and I am looking forward to seeing how is he going to develop his force. 20 Reapers - I don''t know why I labeled them Soul Reavers initially (and you will see them as such on the diagrams) but I guess Reapers can be a terrifying enemy that destroys bodies and souls alike! They are very good at dealing damage thanks to good number of attacks, hitting on 3+ and with Crushing Strength 1. They also have a nice nerve value as Night Stalkers usually do. It means that in order to contain them I may either try to shoot at them first and then engage in melee. But in any case I need some better than average odds in order to destroy them before they counter attack. 20 Doppelgangers - that's quite tricky regiment. They may not look like something threatening on their own but if they have a chance to pick the fight or counter attack the enemy with good melee abilities then there may be a nasty surprise. Definitely a unit to watch out for. 2 x 10 Spectres - these are, on the other hand, well known to me. My own shooters have the advantage over them in terms of range but they tend to sit in some kind of cover so it is not easy to get rid of them. And I would need to at least limit their efficiency because they can quickly evaporate my units. 10 Phantoms - it may be a simplification but somehow Phantoms remind me about Undead Wraiths. They both Fly but are Shambling. 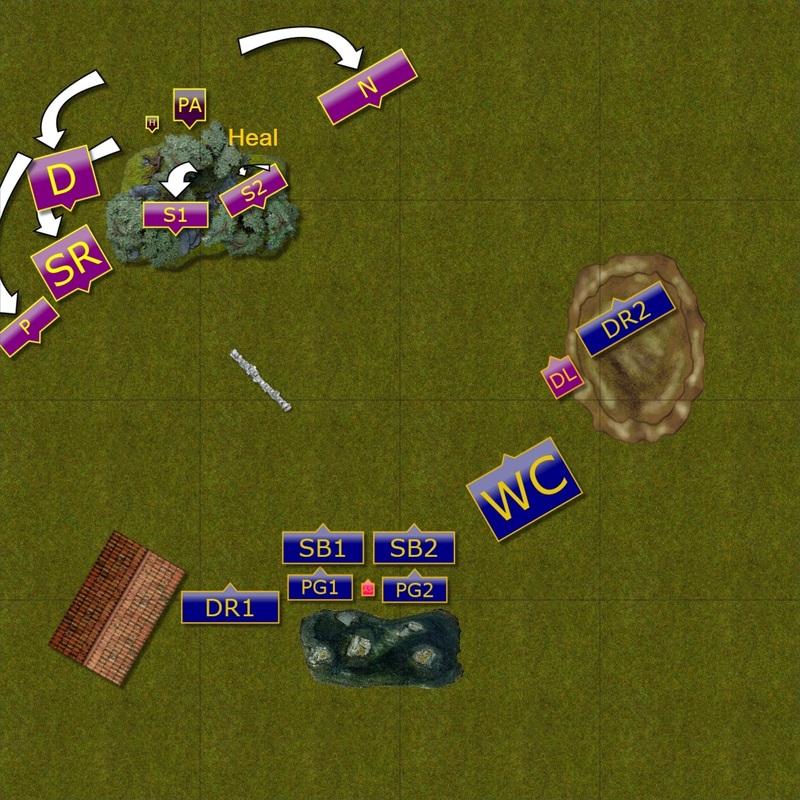 Both have Crushing Strength 1 and can be a nasty surprise when allowed to attack the flank of any unit. 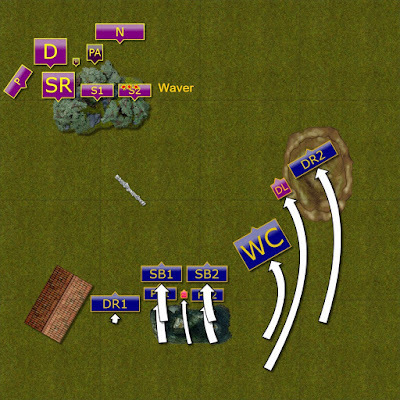 3 Nightmares - this flying large cavalry is not a surprise either. A very good and flexible unit but the main question I had here was "Would I see Wind Blast used?" :) I think it is often tricky to use because on hand the flying cavalry wants to move at top speed to get to the right positions but on the other it has to slow down to use the Wind Blast. The priority would be to catch them somehow as I cannot allow such a fast and maneuverable unit to threaten my regiments, especially when allowed to go behind the lines. Horror - Horror's job is to Surge Phantoms :) It may not be as efficient in it as Undead heroes but it has the tools for the job. It does look very fragile though so I was curious how Sean is going to use it. 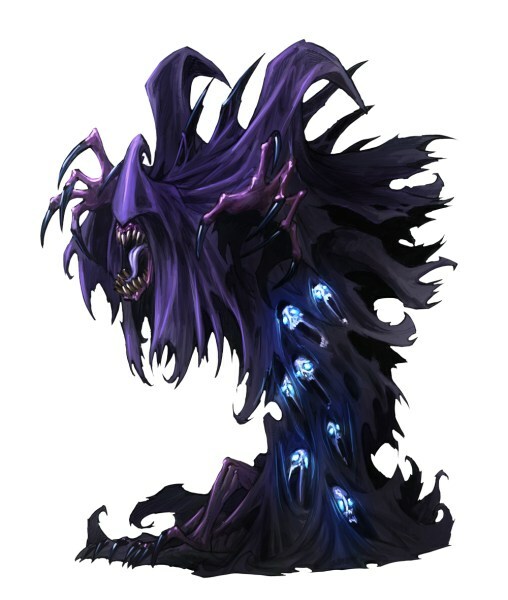 Planar Apparition - a very good supporting monster, hard to kill too. It may help with healing the units that despite good nerve values don't usually sport a lot of armor. But if left unattended it also can deal some damage by attacking exposed flanks. I believed I had some advantage in the speed and maneuverability, I had a chance to shoot from greater range too so I wanted to use these options. Due to the fact we had a similar number of units it would also matter who starts losing them first. 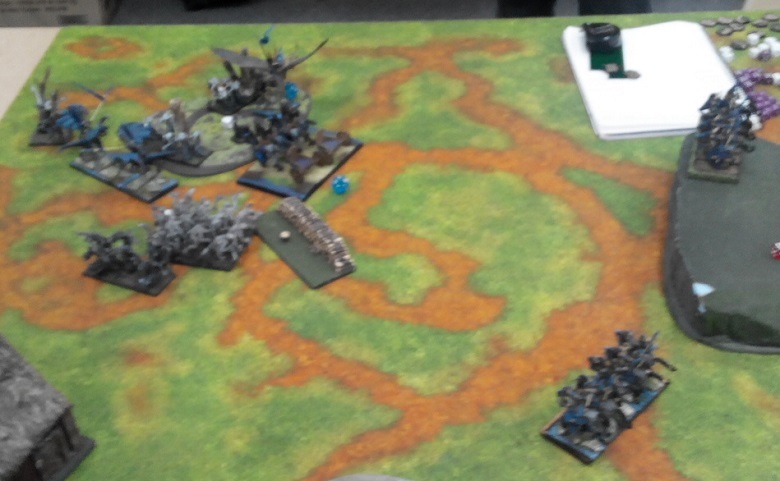 We played Control that was modified for the purpose of the smaller tables. We still had 24" x 24" zones but there were only 4 of them instead of 6. Because of that, for me the top right corner zone would be worth 2 points and all others are 1 point. For Sean, bottom left gives 2 points. 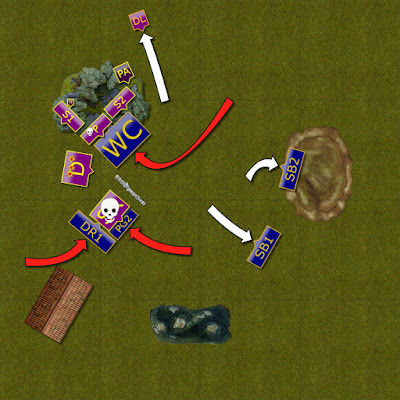 Interestingly, he completely gave up the top right corner but at the same time deployed entire army to push towards the bottom left. I started deploying with the shooters so I didn't get good Line of Sight to many enemy units. 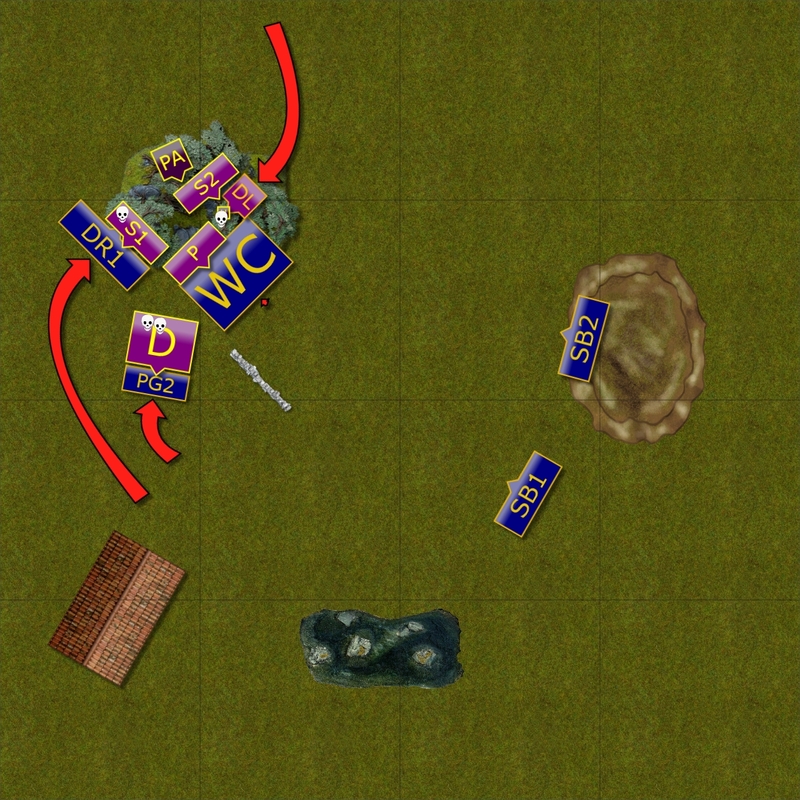 However, I was going to use given opportunity to move in outflanking maneuvers and keep Silver Breeze units as a second line. Each was to hold 1 zone, bottom and top right while their range would allow them to shoot at the enemies from the safe distance. 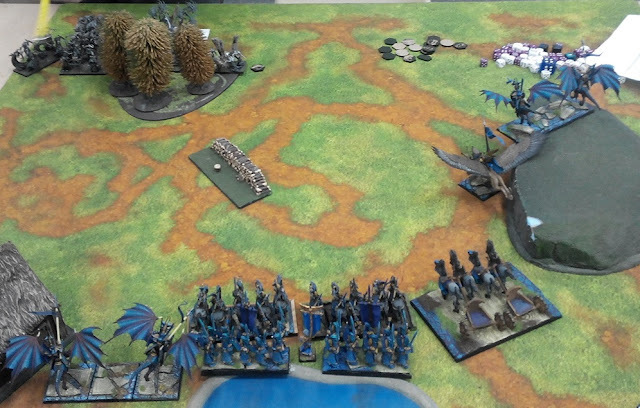 At the same time I intended to keep left Drakon Riders and Palace Guard units as blocking elements to slow down the advance of the enemy towards my deployment zone. 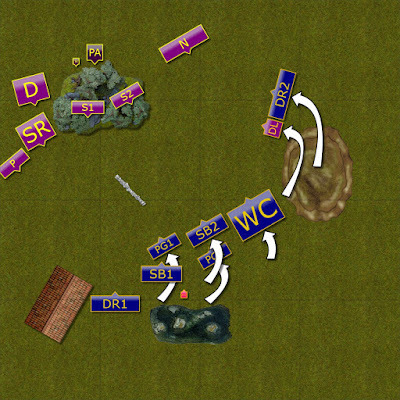 That would also allow the units that were outflanking to be in the position for the coordinated attacks in time. I got the first turn again. 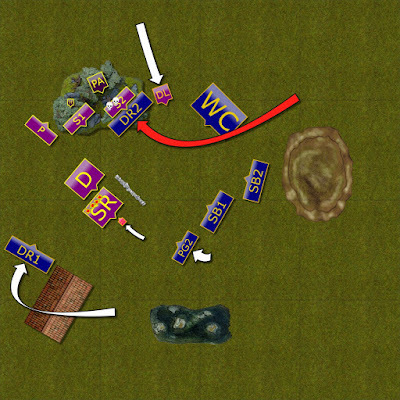 Elves implemented their battle plan immediately by sending drakon riders on the right flank to threaten enemy formation from that direction. 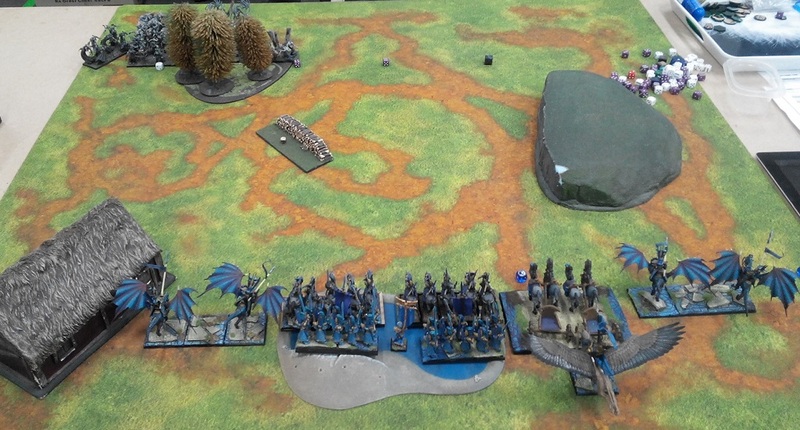 The units in the center advanced too and the shooters aimed at the Spectres and surprisingly wavered them. Good start! Night Stalkers remain in the Twilight Glade. 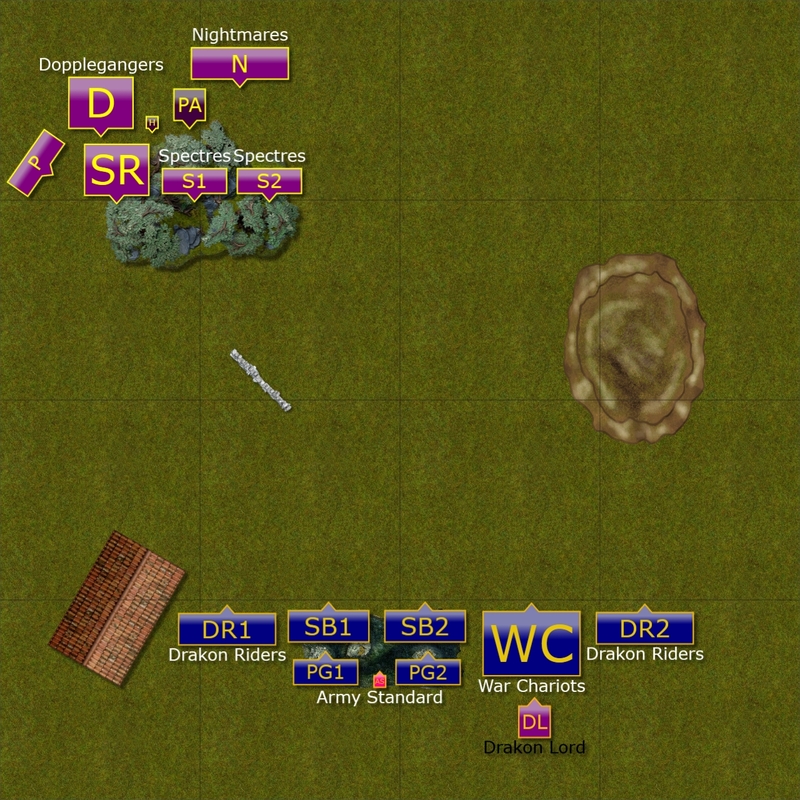 The Night Stalkers didn't want to leave the protection of the Twilight Glade and only shifted positions to respond to the Elven maneuvering. Planar Apparition used the time to heal the damaged Spectres. Tempting Nightmares to charge first. 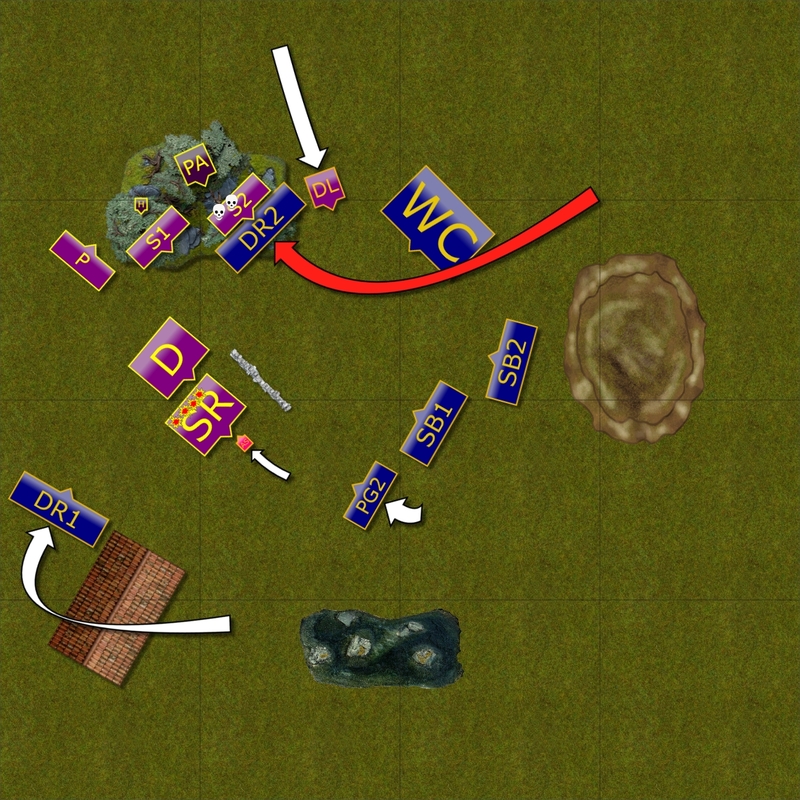 Elves continue maneuvering around the enemy flank but this time they take a bit of a risk by exposing some of the units for a charge of the Nigthmares. Will they take the bait? 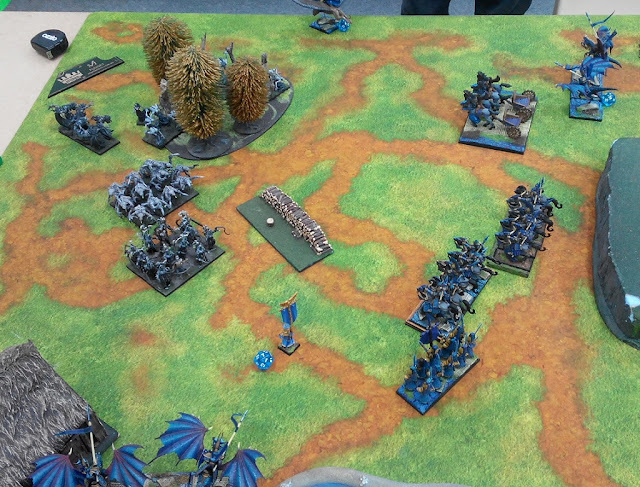 Nightmares did take the bait and attacked Drakon Riders but failed to inflict enough damage to even waver them. Now they were in a very difficult position and had to brace for incoming counter attack. The rest of the army still didn't move forward much but advanced at a slow pace. Drakon Riders and War Chariots teamed up to get rid of the Nightmares. Thanks to that Drakon Lord could move fast forward and start threatening enemy formation from the rear. 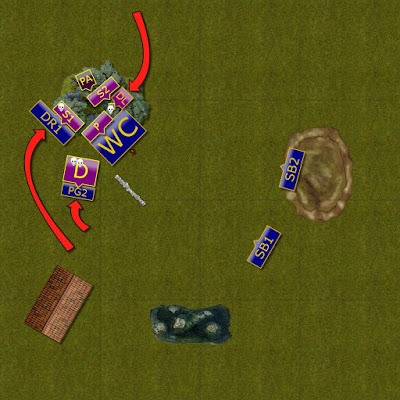 In the South Palace Guard moved forward to tempt more charges of the enemy while other units waited for the opportunity to counter attack. But the army stays in the corner. 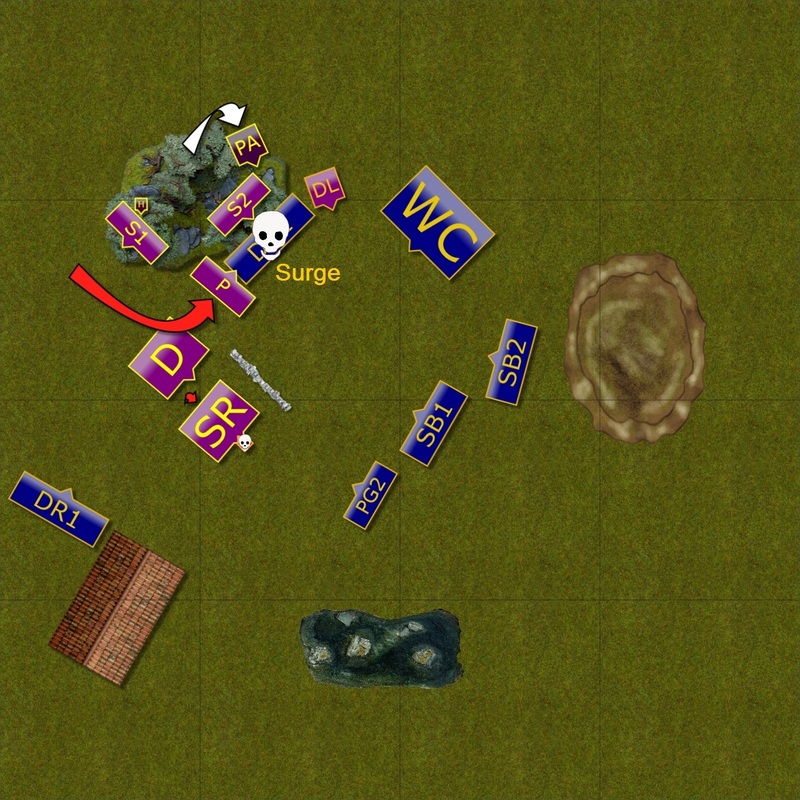 Night Stalkers did not move out of the corner and kept tight formation. Phantoms moved around to be ready to intercept Drakon Lord but Reapers charged and routed the troop of Palace Guard. The Elves try to tighten the grip. 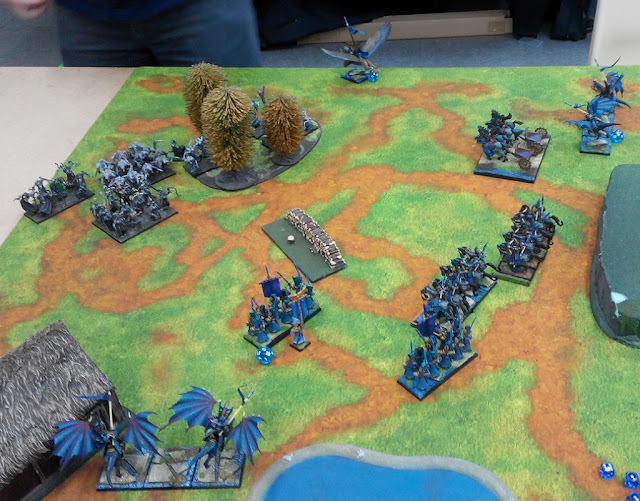 Drakon Riders attacked the Spectres in order to prevent them from shooting but the damage was not enough to rout them and Elven flying cavalry was in a dangerous spot now. 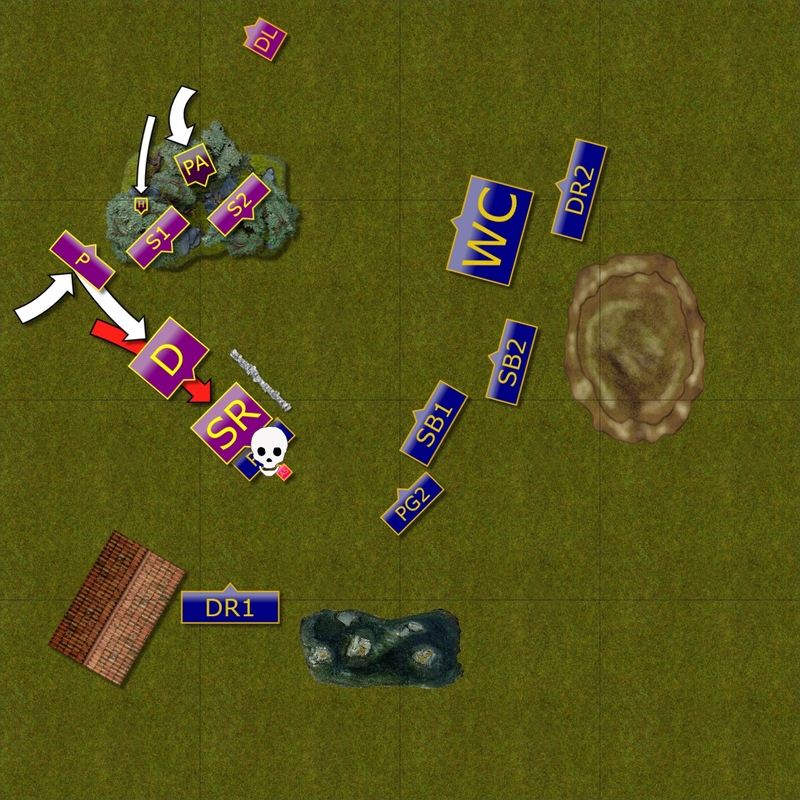 The sacrifice by Palace Guard didn't pay off either as Reapers pulled back and the second unit of the Elven elite infantry was too far to assist Drakon Riders. The Army Standard took on himself to keep distracting the enemy so that his companions can prepare a better counter. 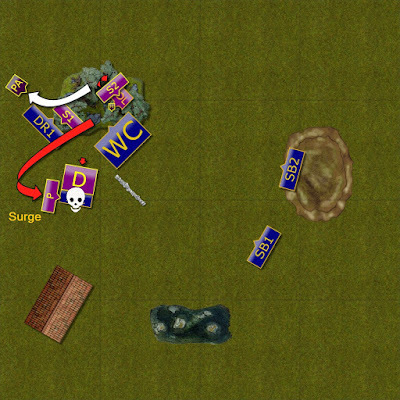 Night Stalkers crush the first wave of the attackers. The Drakon Riders paid the ultimate price for over committing in their last attack. 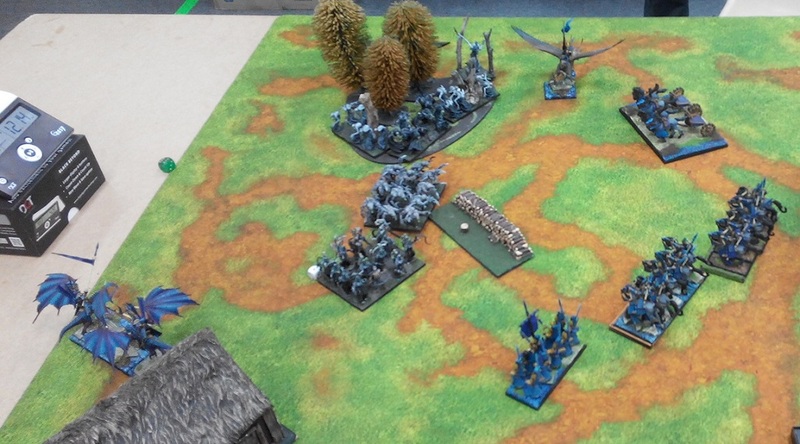 Phantoms, supported by the evil magic, were teleported into the flank of the Elven unit and routed it. Also the Army Standard was no match for the Reapers. The end of the Reapers. 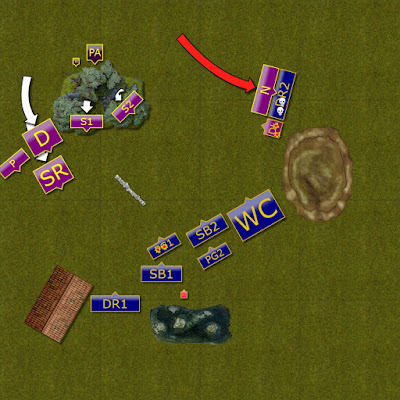 It was time for the Elves to counter attack if they wanted to contain the Night Stalkers and not allow them to break the encirclement. 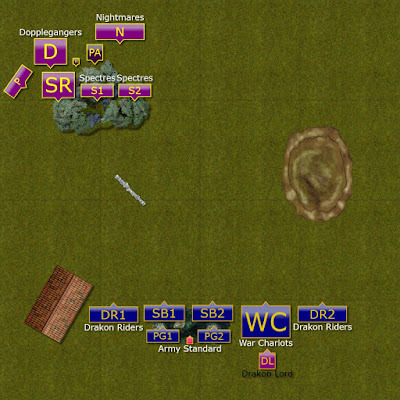 Drakon riders and Palace Guard attacked exposed Reapers and this time the unit perished. 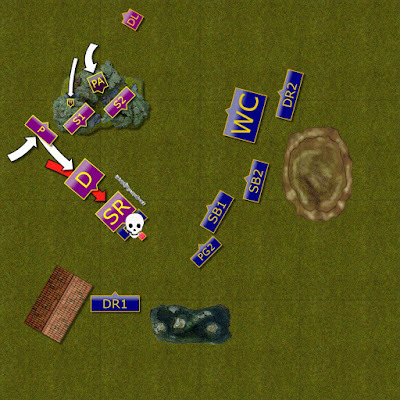 The War Chariots attacked the Phantoms to prevent them from flying away and to block Spectres from seeing any other targets. Night Stalkers cannot break through. Almost entire army of the Night Stalkers hid in the forest and although Phantoms tried to get rid of the Chariots they could not do it. The army was literally cornered. However, they fail to rout any! 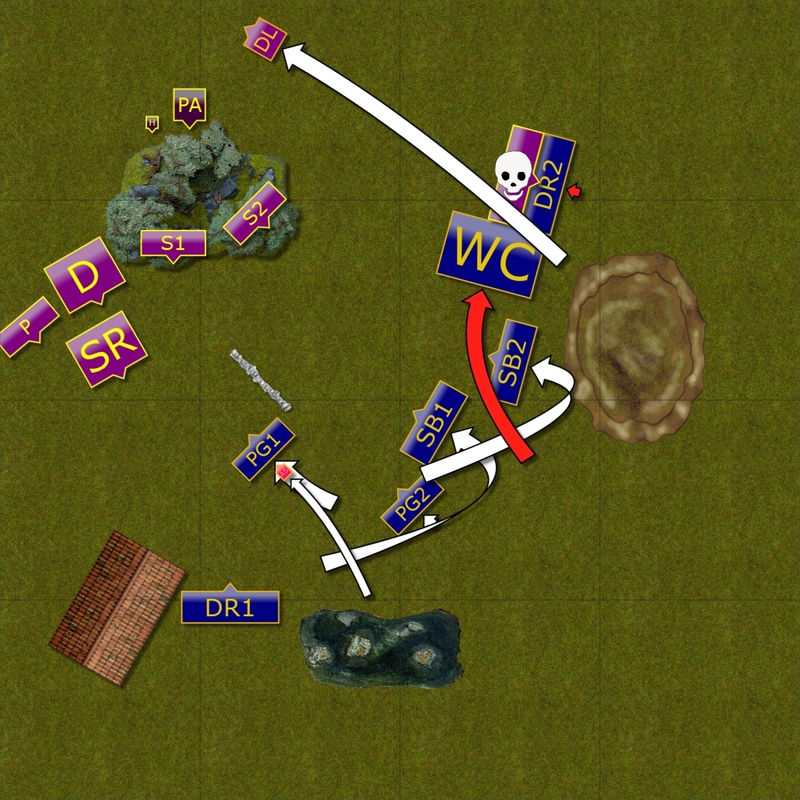 Arrogant Elves decided it is a perfect moment to attack many enemy units at the same time and that didn't work in their favor. All the attacked enemies held their ground and Elves had to brace for the impact. Elves are punished for their arrogance. Night Stalkers smelled the opportunity and attacked unsupported Palace Guard that could not hold against combined charge of the Phantoms and Doppelgangers. 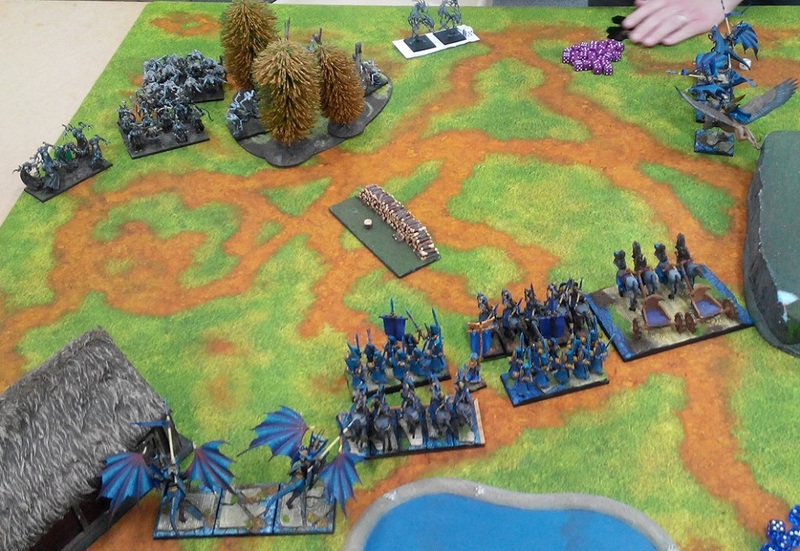 That allowed these two units to move forward and Phantoms finally invaded Elven territory. 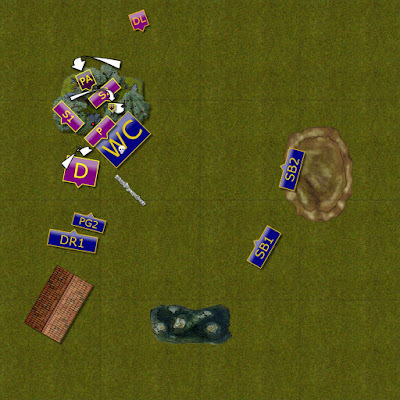 However, that was too late and Elves still claimed the control over the battle field. Just! That was close! Many thanks for Sean for a great game! I really hope he is back for good and that he will be a regular participant of the tournaments and casual gaming nights. 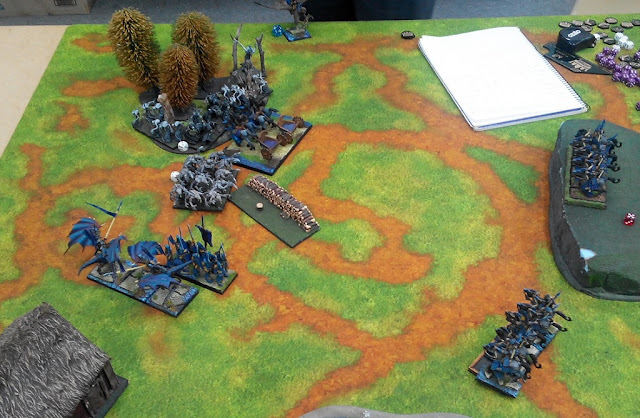 In the end Elves controlled 2 zones for 3 victory points while Night Stalkers claimed 1 zone for 2 points. 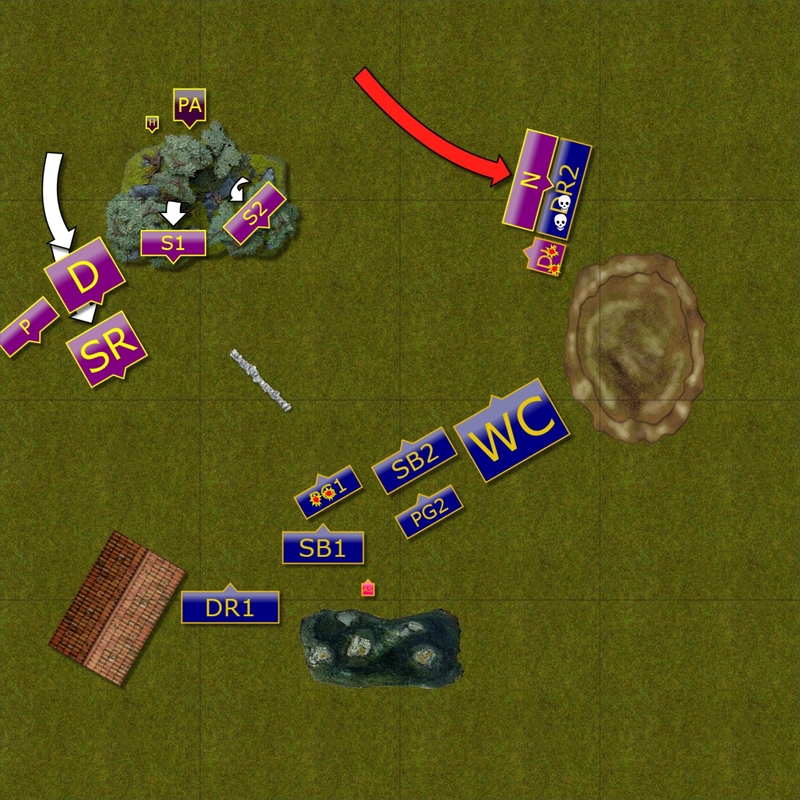 The 4th zone was contested and that is a very lucky turn of events for me after that huge blunder in turn 6. 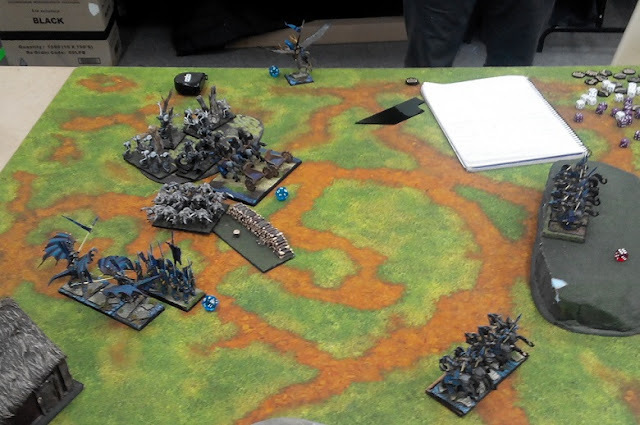 Instead of dispersing forces and not routing a single unit I should have attacked damaged Doppelgangers with Drakon Riders and Palace Guard as even the frontal charge should have given me the opportunity to rout the unit. Then I could withdraw them to keep my own zone controlled. Or even better, advance with the Drakon Riders and pull back with the Palace Guard for the potential chance to control all of the zones. It was serious blunder and could potentially lead to a draw. In terms of attrition we actually had almost identical amount of points routed so I claimed the very minimum for the victory conditions. 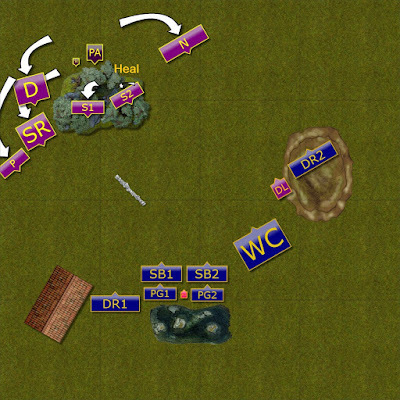 I am glad I got lucky but not so happy that after patient maneuvering and keeping the enemy army in the corner I almost lost it all. Well done on the win! I've often wondered about dopplegangers since first reading about them. Did their ability affect this battle in any way, do you think? Nightstalkers are one of my favorite armies to see in reports, I think, because there's so much creativity in how different people depict the units. I find Doppelgangers to be a psychological weapon. 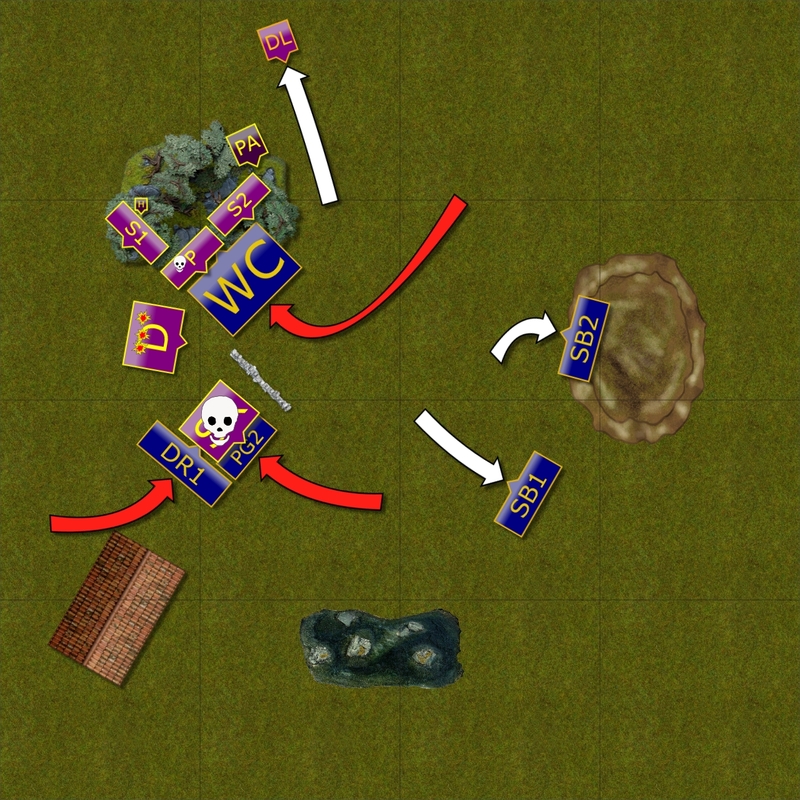 One has to think more carefully which unit to commit against them as they may fight back. 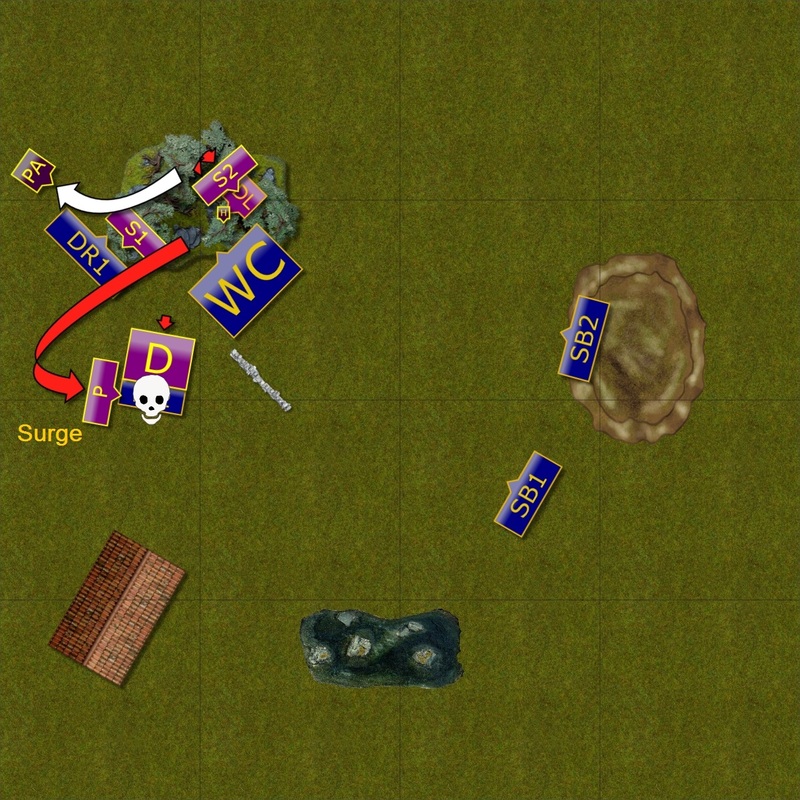 And 150 points for the regiment is not too bad either. On the other hand I don't think I would have done something different if they were not present. I always try to create a situation where I can win comfortably and this time I was reminded that I should not risk one on one combats even if the enemy is damaged. I’m all in on nightstalkers thanks to the Vanguard kickstarter so it was a pleasure to read up on them. 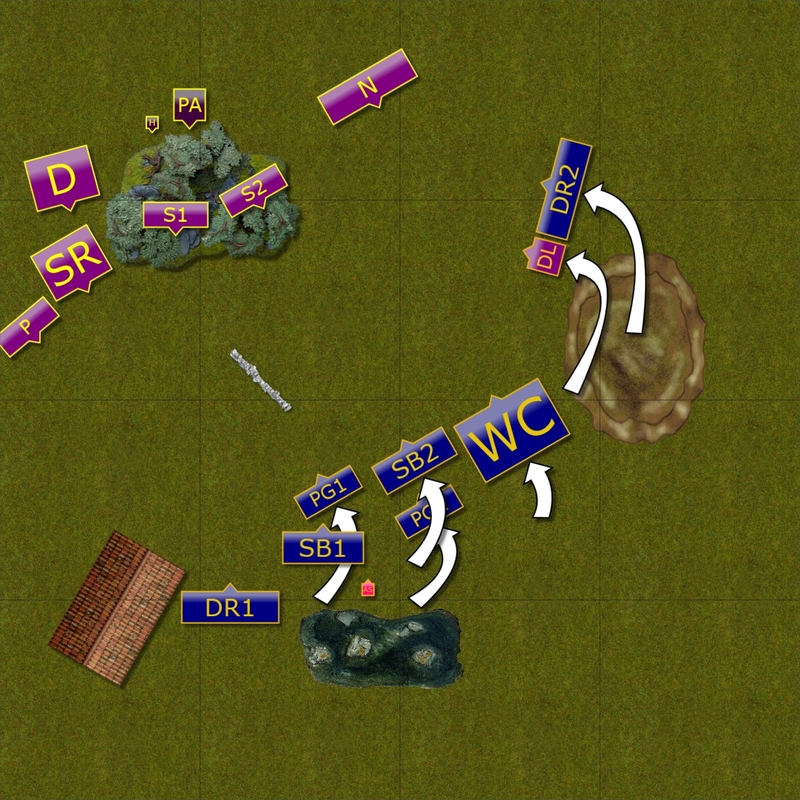 They have a lot of different units and are a very unique force that I believe can be played a variety of ways. Speaking of doing well, I saw that you qualified for masters! Congratulations, I can’t wait to read those reports. Maybe before then, we could get a blog entry on your list with pictures of the units since you’ve been working on them! Thanks a lot! Indeed, the new models are really good and I would love to see the models in flesh. I don't plan to collect them but it is very good to see the quality of the miniatures improving. Qualifying to Masters is a huge achievement and I am really happy to be part of it! I would not have been able to get there, however, if not for Matt and Tas who are fantastic tournament organizers. They did a great job to provide plenty and regular events to attend and quite a number of players started showing up which is a great thing! I will do my best to get some new pictures as I hope to finish the chariots just for the event. Thank you! The photos are the key as they allow me to refresh the memory. I also don't want to write about single dice roll (which I can't remember!) so I try to make the write up short and more in a narrative style. In this way it gives the idea to the reader what have happened. While pictures and maps help to visualize the situation better. If you want to write a report start with casual games where there is no time limit. I always add "photo shooting phase" at the end of the turn so that I don't forget to take one. 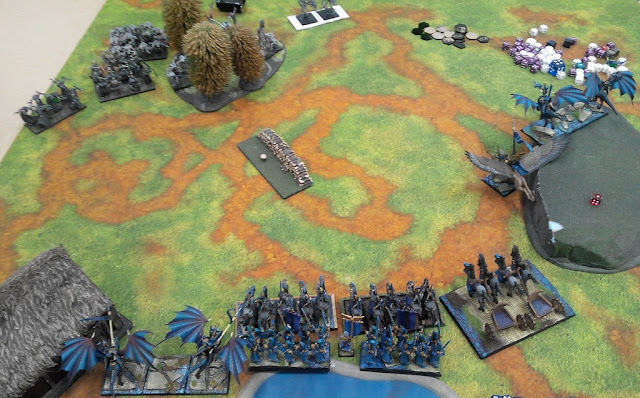 Usually I take the photo that shows the battle field rather than a close up so that it is easier to see the units. And if I have the same number of photos as the turns played I should figure out what happened when. 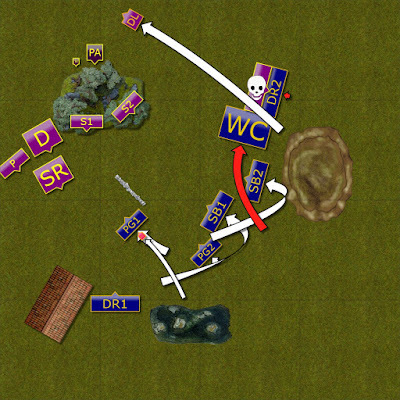 That was a really interesting tactic from your opponent, he really went defensive against you and it sounds like the battle could have swung both ways at different points. Oh and congrats on the masters! Fantastic news. During the game one tends to be very focused on what he can try to outsmart the enemy. Only during the writing of the report I often notice how close it was to losing the game for me! :) It also shows I need to maintain that focus and Masters will test that skill to the limits!